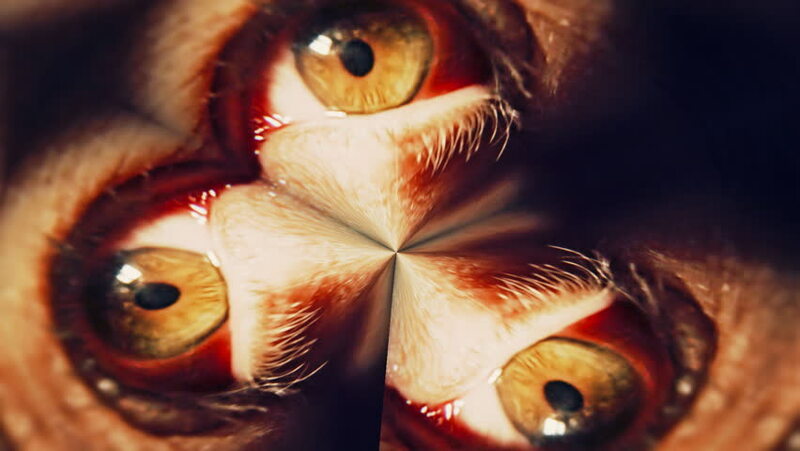 A scary macro shot of the eye of a man girl, distorted and tripled. As seen as i.e. a person under drugs or having a nightmare. Be creative! hd00:10Flickering alternating shots: a zombie trying to assault the viewer, blocked by a frosted glass; a disturbing macro shot of the eye of a man, distorted and tripled. hd00:19Festive fireworks igniting the sky on Fourth of July. hd00:08A CCTV screen recording: a threatening old man - a zombie - comes very close to the camera, his mouth wide open, ready to eat the viewer. Disturbing, scary, spooky shot. hd00:18Fake VHS tape: heavily distorted stylized macro shot of the eyes of a man moving fast, visible iris. Under drugs or having a nightmare. Be creative! hd00:20Fake VHS tape: an old man getting upset, angry and furious with the viewer, yelling and screaming (no audio). hd00:09Macro shot of the eye of a zombie. Disturbing, scary, spooky shot. Seen through a keyhole. hd00:13Heavily distorted stylized macro shot of the eyes of a man moving fast, in blue on black. As seen as i.e. a person under drugs or having a nightmare. Be creative. hd00:06Macro shot of the eye of a zombie searching for food (human flesh), then running away. Disturbing, scary, spooky shot.